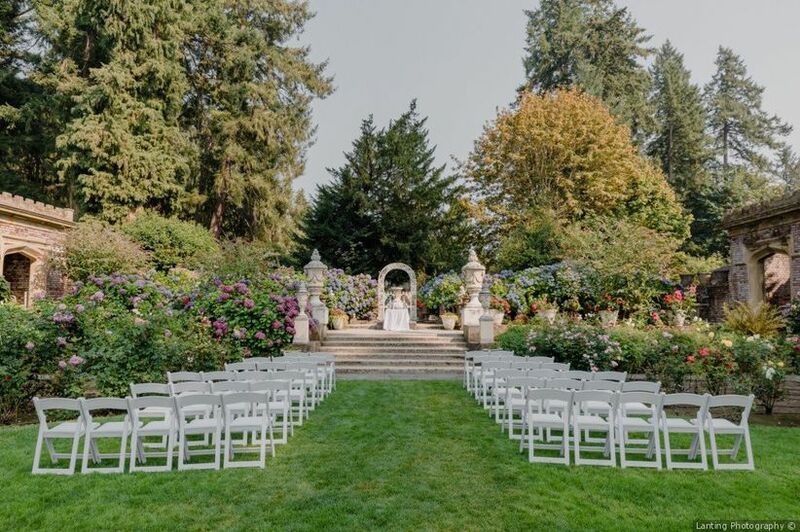 With so many different options and venue styles to choose from throughout the city, narrowing down the best Seattle wedding venues is no small feat. 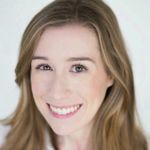 But the great thing about getting married in Seattle is that there is a perfect venue for every type of couple, whether your style is classic, modern, unexpected, or something in between. We've rounded up our favorite spots across the Emerald City to help you plan your dream Seattle wedding. 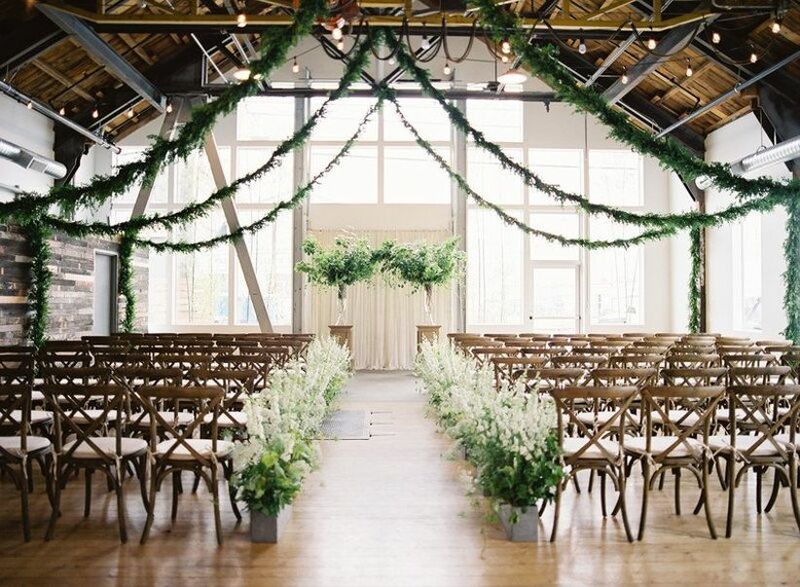 Here are the best Seattle wedding venues for every style. 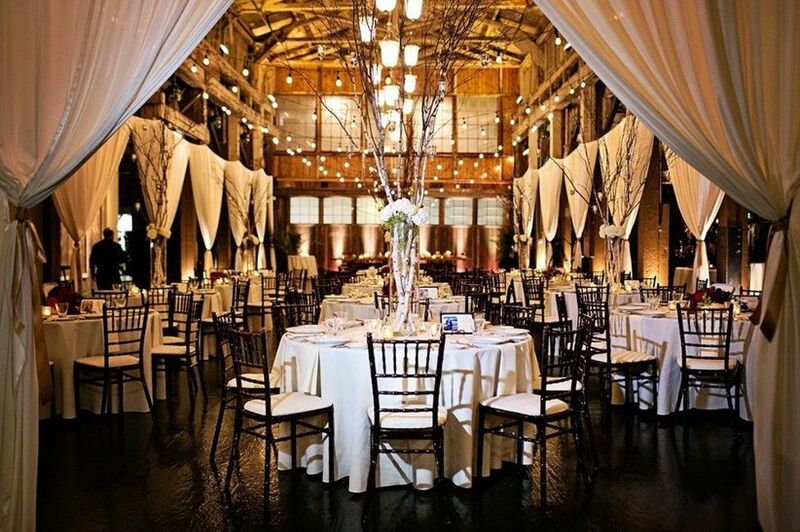 Imagine having the ambience of a rustic barn venue and the convenience of downtown Seattle wedding venues all in one place. We’re talking about Sodo Park, a refurbished, award-winning event space that’s located less than 10 minutes from downtown but feels like a world away. The building itself is a century-old factory, which explains the unique exposed beams, vaulted ceilings and urban feel throughout the venue. Sodo Park is perfect for any couple who loves the classic barn wedding look but wants to take it to the next level. Sometimes dubbed as Seattle’s “Most Romantic Hotel,” Hotel Sorrento offers a timeless and elegant backdrop for a classic wedding. 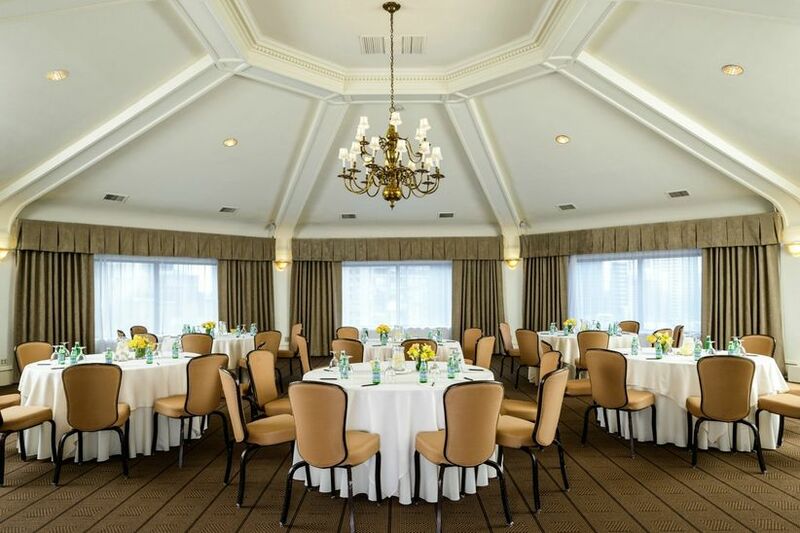 With event spaces including a traditional ballroom, an outdoor terrace and a penthouse, Hotel Sorrento has a spot for everyone, whether you’re hosting a wedding with a large guest list or something more intimate. Built in 1929, this Art Deco building is perfect for couples who love vintage style. The venue’s gorgeous Grand Room, which can accommodate a seated dinner for 150 guests, has 25-foot ceilings with a stage area at the front of the space for a band or DJ. If you host your wedding at Sanctuary at Admiral, you also have the option to rent place settings, tables and chairs directly from the venue. Looking to escape from the hustle and bustle of downtown? 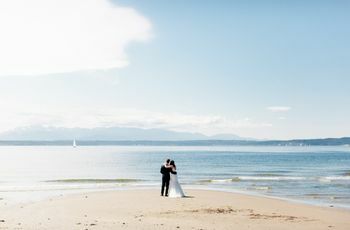 The Quintessa on Whidbey Island has all the perks of a destination wedding without requiring you to travel far at all. 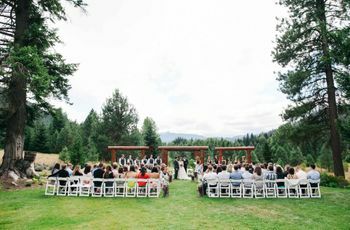 Just an hour north of downtown, this intimate Seattle venue is ideal for weddings with 50 or fewer guests. The best part is that everyone can stay onsite. At the Quintessa, the main house has nine bedrooms, while a cozy cottage offers additional privacy for couples. Whidbey Island itself is full of charm, with quiet seaside towns, numerous parks, historical sites, and unbeatable scenery and wildlife. Exchange your vows on a terrace overlooking Elliott Bay, then head to the aquarium’s Tide Pool room where you and your guests can get up close and personal with some of Washington’s local sea life. 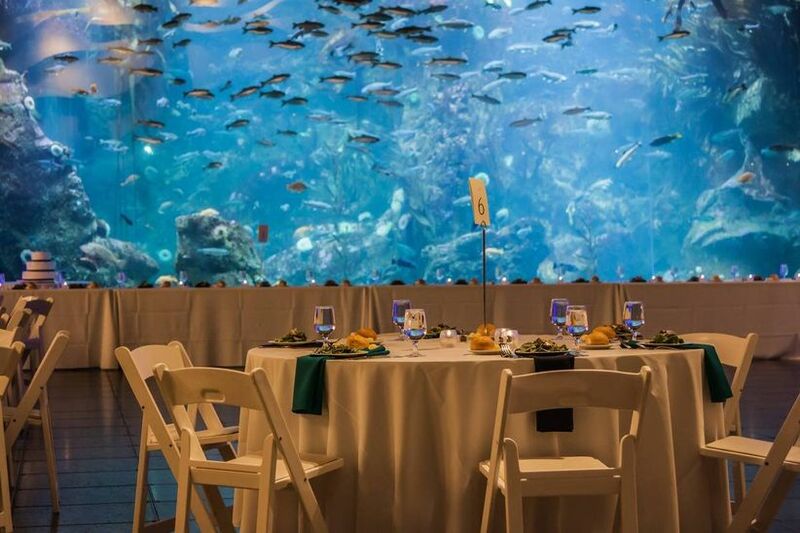 The aquarium’s underwater dome is a one-of-a-kind setting for your wedding reception, with 360-degree views of the 400,000 gallon tank, which is home to hundreds of fish and sharks. While the aquarium is sure to be a memorable experience for your guests, the venue also offers a lot of practical amenities for you as you’re planning the wedding, including in-house catering, linens, wedding coordinators, and more. 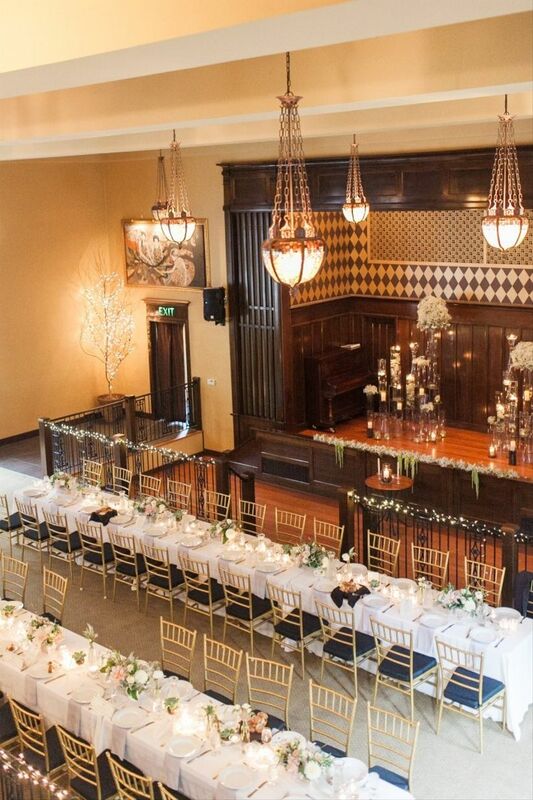 Metropolist is one of the best Seattle wedding venues if you want to get married downtown. This cool industrial chic location was once a factory for construction cranes, and the venue still retains some of its urban warehouse feel today — hardwood floors, vaulted 25-foot ceilings, and exposed pipes, for starters. Metropolist is a totally customizable venue, whether you want to keep the existing open floor plan or transform it into your own space using pipe and drape. 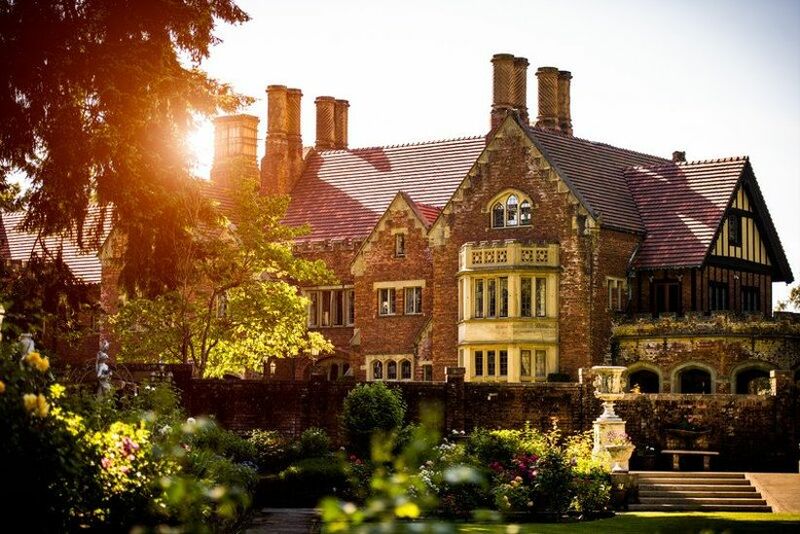 If you’re dreaming of a fairytale wedding, look no further than Thornewood Castle. 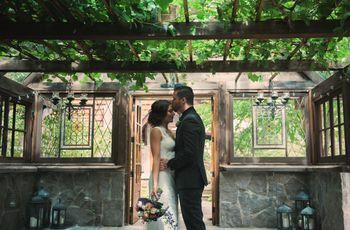 This storybook venue features an English Tudor-style mansion nestled on four acres of secluded lakefront property, complete with sunken formal gardens (see our favorite garden wedding ideas here), stone fountains, and a private dock. The house itself looks like something out of Beauty and the Beast, with medieval stained glass windows, dark oak paneled walls, and stately ballrooms. Outdoor-loving couples will want to take advantage of Washington’s famous scenery, from Mount Rainier to the lush Cascade Foothills that surround downtown Seattle. 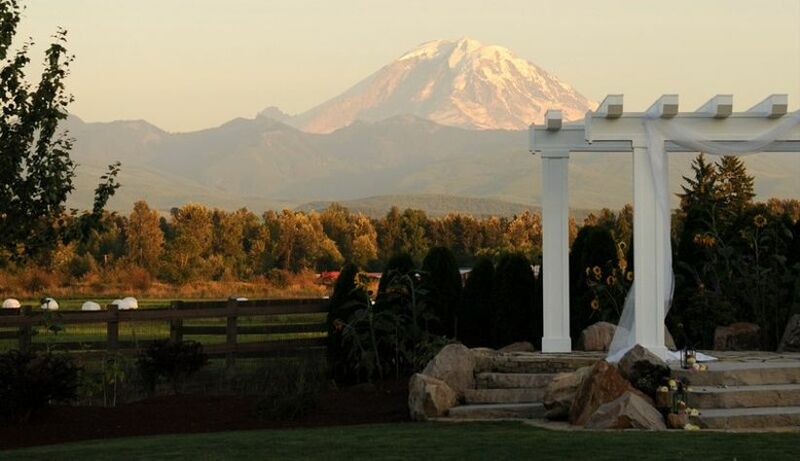 Mountain View Manor, a 40-acre wedding venue located about an hour from downtown, offers a beautiful setting with an unobstructed view of Mount Rainier that your guests won’t forget. 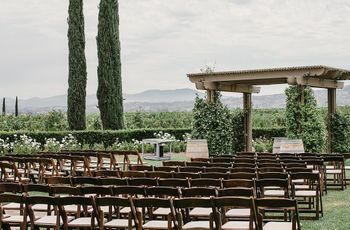 The rustic-style venue can accommodate up to 300 guests and also provides basic items including a white reception tent, chairs, tables, and portable restrooms. If you didn’t already want to get married in a treehouse (or if you didn’t even know that it was possible), this venue is sure to sway your decision. Nestled in the trees of Issaquah about 40 minutes from downtown Seattle, Treehouse Point is perfect for anyone who wants something off the beaten path. 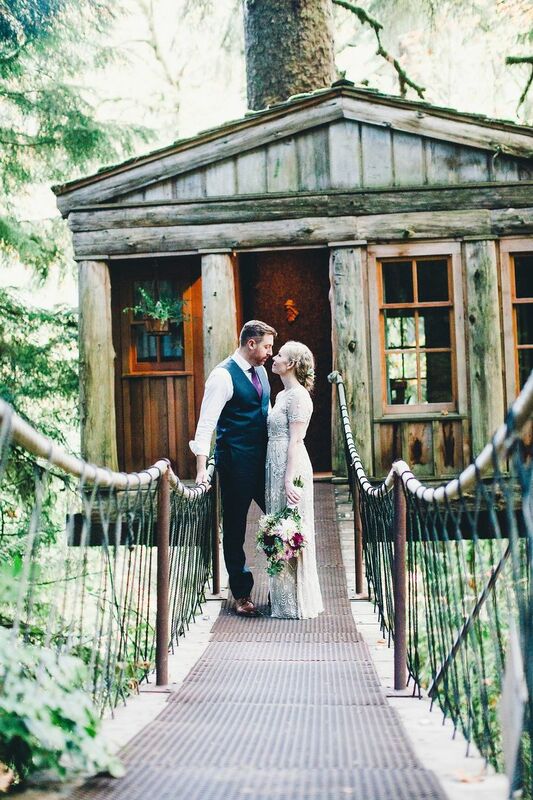 This unique location is one of the best Seattle wedding venues for elopements (see how this couple did it) or very small groups up to 18 people. You can even stay on the property overnight! Our list of best Seattle wedding venues wouldn’t be complete without a waterfront option (see more Seattle wedding venues on the water right here). The Woodmark Hotel & Still Spa overlooks beautiful Lake Washington with views of the Olympic Mountains in the distance. This luxury boutique hotel offers all the same amenities as any large resort while retaining the inviting, personalized feel of a bed and breakfast. 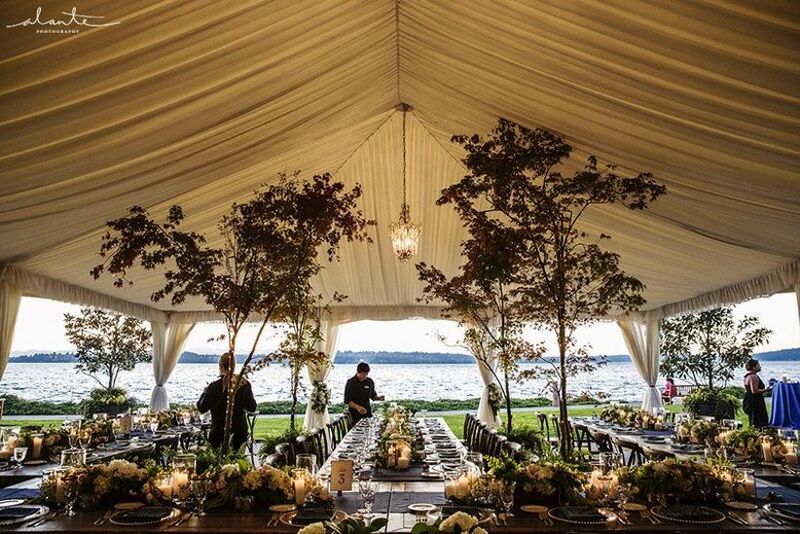 All five of the venue’s event spaces have picturesque lakefront views and range in size to accommodate a variety of Seattle weddings. 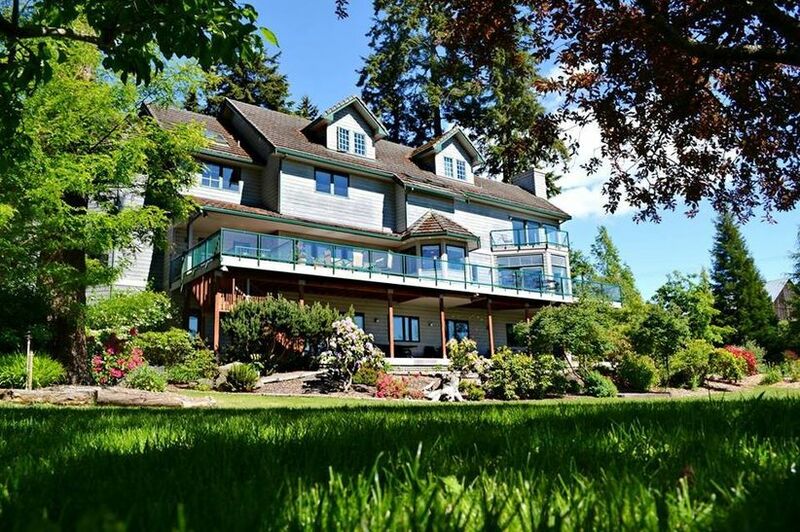 Other venue amenities include in-house catering, lake cruises, and a spa. The Great Hall at Union Station is our top venue choice for any couple looking to host a truly upscale wedding. This landmark building in Seattle’s Pioneer Square was built in 1910 and features breathtaking architectural details, such as barrel-vaulted ceilings, inset ceiling lights, mosaic tile floors, and glass skylights. 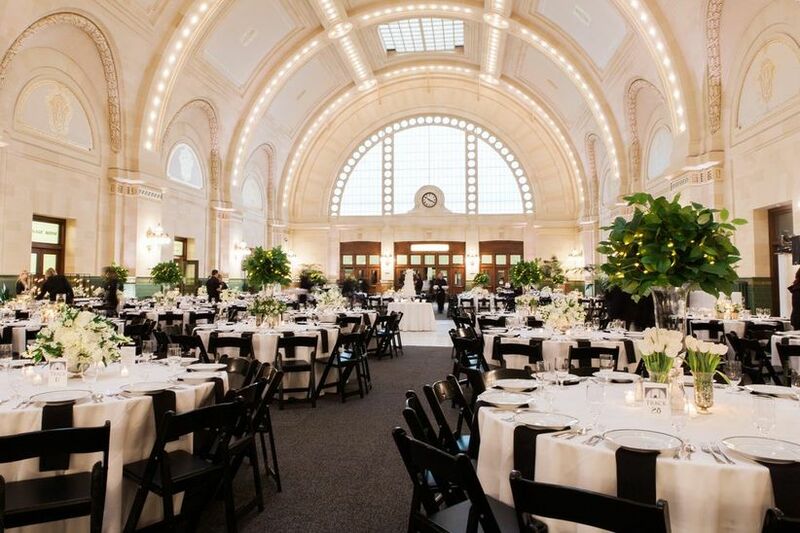 With a capacity of 500 guests, The Great Hall at Union Station is among the largest and most elegant Seattle wedding venues.